This page briefly outlines the process I used for making the canopy for my 1:5 scale RC Lunak glider. Sorry that it's not an overly detailed page, but I was so intent on the job in hand that I neglected to take many photos - sometimes I just like to get on with my hobby without thinking about adding everything to the website! Anyway, the canopy was a big concern for me as soon as I received the plans for the 1/5 scale Lunak glider. Although the plan showed a "modified commercial canopy" I knew it would be unlikely that I'd find anything remotely suitable. Even a cry for help to an rc scale glider guru didn't yield any results, so I knew sooner or later I'd have to make my own canopy. If you're going to vac-form your own canopy, the first thing to do is make a solid plug. 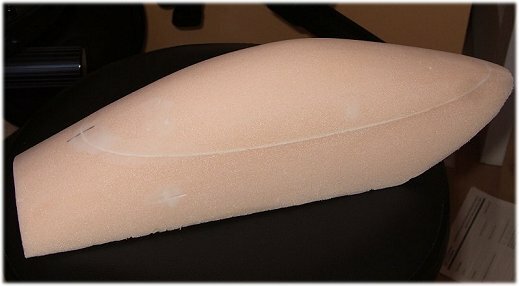 A phone call to model vac-forming company proved invaluable here; the guy told me how to make it, and to make sure that the finish is as smooth as possible, since vac-forming shows up the slightest imperfections. The core of my canopy plug was pink foam (underfloor insulation readily available from builder's merchants). I used 2" thick foam, two layers glued together to make a 4" thick block. Now, because vac-forming puts a lot of pressure on the surface of the canopy plug, you can't just use foam - you need to reinforce it. This was done with two layers of fibreglass cloth and epoxy resin, then about 4mm of car filler. This produces a rock solid plug, but needless to say there is a lot of carving, sanding and shaping to get the end result. It's just a case of shape and fill, shape and fill, over and over until you're happy with the final canopy shape. Above: the foam canopy plug core is just the start of a long and messy process! 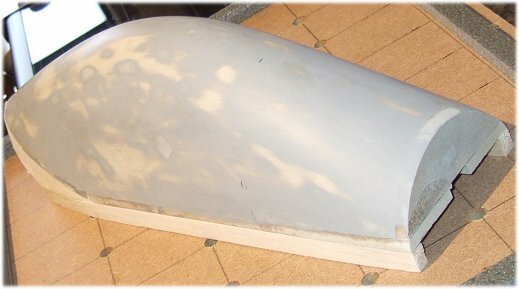 Above: the finished RC glider canopy plug. When finishing the canopy plug, it's helpful to spray it in a few coats of car filler primer - this helps fill any tiny imperfections, and also helps emphasize other imperfections that you can then sort out. One crucial thing is to make the canopy higher than it needs to be, by at least half an inch or so. You can either make the plug height bigger from the start, or you can make the plug the correct size and then glue strips of wood (I used 1/2" balsa strip, visible in the above photo) to the underside to increase the height. Why? Because the canopy material doesn't bend 90° at the plug base when it's vac-formed, it forms a curve instead. So if you don't have an over-high canopy plug, your finished canopy will curve outwards at the bottom instead of being vertical all the way down. Bottom line - take your time with the plug, and accept that it's no small job! I'm not going to go in to details with this, because you can do what I did and get good ideas from YouTube videos - there are plenty to choose from. Essentially, you need to make an appropriate size box* with many holes drilled in the top, and a single hole in one side big enough to accept your vacuum cleaner hose (without any attachments). 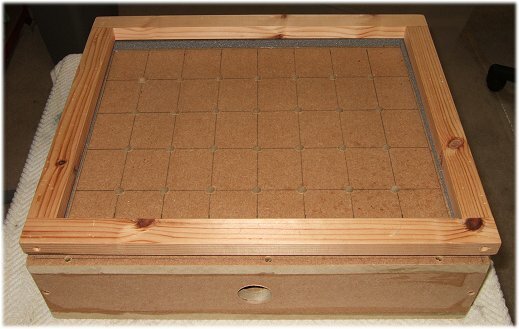 I made my vac-former box from 15mm thick MDF, and drilled the holes at about 50mm intervals in both directions. I'm a chippy by trade so it wasn't too difficult a job for me, but if your woodworking/DIY skills are lacking then it would be worth getting a local craftsman to knock one up for a small fee. As well as the box, you need to make a frame on which to attach the clear plastic. This frame needs to be the overall size as the box top. I used something like 25mm x 15mm softwood for the frame, screwed together at the corners. You also need to put strips of sticky-back foam (draught excluder or similar) around the top of the box, on which to place the frame when the time comes. This makes a good seal. *NB: not only does the vac-former need to be big enough to accept the canopy plug, it also needs to be small enough for the frame to fit in your oven! Above: my home made MDF vac-forming box. Above: the top frame which the clear plastic fixes to. Make sure this will fit into your oven! 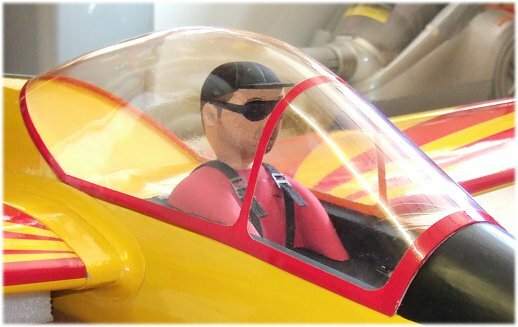 There are several clear plastics available, but the most common for vacuum forming use, especially in the model plane world, is PETG (Polyethylene Terephthalate Glycol) sheet. Whatever you do use, it has to be suitable for thermoforming - this is the critical property of plastic used in making an RC glider canopy! PETG is by far the most popular -it's easy to work with and readily available, and this is what I would recommend. The biggest question mark you might have over material choice is its thickness, and I really just guestimated what I needed for the Lunak canopy, going for 1mm thick sheet. As it turned out, I think I guessed wisely as my glider canopy isn't too flimsy, nor too thick. 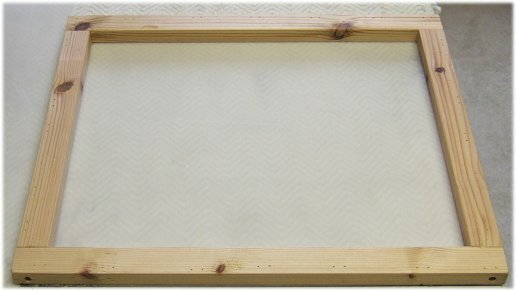 Once you have your sheet material, simply lay the wooden frame on it and draw round it, then cut out the rectangle (sheet metal cutters - tin snips - are perfect for this). Securely attach the PETG to the frame, I used a large stapler to do this, and sealed each edge with duct tape. I don't know if the tape is necessary, but I just thought it would make the suction more effective if no air was leaking in around the edges. RC glider canopy final stage. So now we have a home made vacuum former, and a piece of PETG sheet attached to the frame. It's also handy - as I learned - to have a heat gun to hand. Put the vac-former somewhere close to your oven, and place the canopy plug on it. Also connect the vacuum cleaner to the box and make sure there is a good amount of suction through all the top holes. You now need to heat the oven to about 170°C and place the frame inside (remove the oven shelves, and rest the frame on the shelf supports). After a few minutes the PETG will start to sag, and you need to keep a careful watch on it. Let it sag about 50mm or so, and in the meantime fire up the vacuum cleaner. Using oven gloves, remove the frame from the oven and put it in place over the vac-former, pressing down around the edges to squash the foam and get a good seal. You might be surprised how quickly it all happens (I was the first time! ), but with any luck the PETG will get sucked down over the canopy plug. If there are places where it doesn't form properly, use the heat gun to re-heat the PETG. Be very careful though, it's all too easy to melt a hole in the sheet at this point. Leave the PETG in place for a minute or so, just to let it cool down and regain its rigidity. After vac-forming the glider canopy, it's then just a case of carefully cutting it out and painting on any framework etc. Above: Job done! The finished RC glider canopy on the Lunak. Return to my RC Lunak glider page.